"TO WHOM IT MAY CONCERN: CENIZA ASKS YOU AGAIN AND AGAIN THAT IF YOU WANT ANYTHING FROM HIM YOU MAKE IT BRIEF AND THEN LEAVE DIRECTLY, UNLESS YOU HAVE COME, LIKE HERCULES TO HOLD UP THE ARMS OF AN EXHAUSTED ALTLAS. THERE WILL ALWAYS BE WORK FOR YOU TO DO HERE AND FOR AS MANY OTHERS WHO WALK IN, TOO.."
Sign above the door to Ceniza Horg's Study. No biography of Altimus Horg can be complete without a mention of his twin brother Ceniza. Altimus cited Ceniza as the inspiration for many of his more curious research exploits, and never failed to credit his influence in his books, publications, research journals, and the prodigious volumes of meeting minutes from all his associations and foundations. 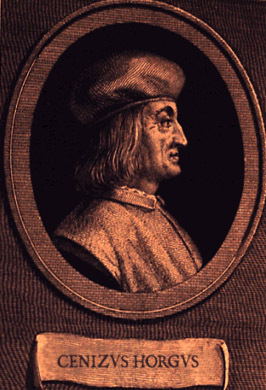 Though there was no official record of his birth, Ceniza was assumed to be the older twin, otherwise looking practically identical to Altimus in every way, even sharing the distinctive scar Altimus aquired on the chin from a printing mishap as a child- a result, stated Altimus, of he and his brother attempting to juggle printer's blocks late one night. Altimus and Ceniza also dressed exactly alike, though it is reported that Ceniza liked wearing his cap a little to the left. This small difference, and Ceniza's rather more aggresive and dour demeanor, were the only visual clue that visitors could use to determine as to which brother they were speaking. Ceniza was chiefly occupied with securing financial support for Altimus's publications, and his quick wit and violent temper, in stark contrast to Altimus' demure scholarly bearing, was well known and feared in Florence's academic circles. Many of Ceniza's grants and loans were aquired through a combination of threats, public humiliation, wild hand gestures, and spastic fits. When some of Altimus' more obscure tomes were judged unsellable, many creditors preferred to shelve the books in unnamed storehouses than endure an uncomfortable meeting with his older brother. Despite the evidence of lifelong collaboration between the brothers Horg, rarely did they venture out in public together. In fact there are no accounts of anyone seeing both Altimus and Ceniza in the same place at the same time.1 Though both brothers travelled together, Only Altimus ever spoke at the various universities, laboratories, and seminary functions througout Europe. Altimus et Cenizus Horgus - Cognosco In Suboscurus Eternum. 1.There is one report from 1641 of a Milanese creditor by the name of Francesco Collona, who attempted to corral both brothers in order to collect payment on one of the numerous loans in Ceniza's name. When the creditor encountered Altimus, he was informed that the twin brother had "just gone out for a chocolate." After several hours, Ceniza appeared, angrily demanding an extention of his loan. Ceniza's temper was well known and feared in Florence's academic circles, and Francesco was quick to comply. Francesco did note in his logbooks, however, that during his conversation with Ceniza, Altimus was nowhere to be seen, and did not reappear until after Ceniza had stormed off with a receipt of his extention.